The video tutorial Loading and Merging Log Files on Youtube will explain how to work with logs. Ascolog Insight supports the merging of logs originating from different sources (log files). All logs are displayed in a single scrollable view (Log window) without the need to switch between pages to see a certain log record. Log records from different sources can be easily distinguished by their color in the Log window. The user can configure a default column which is used to determine the order of the log records from the different sources in the merged log. This column is called merge column. It is useful to choose a column that contains comparable data, e.g. the timestamps of the log records. The merged log is displayed in the Main tab of the Log window. 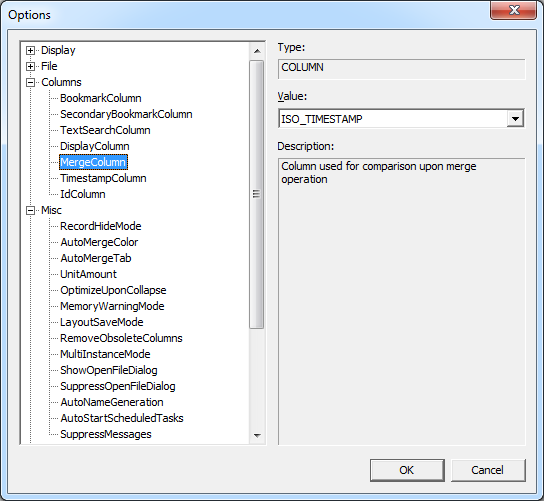 In order to configure the merge column open the Tools menu and select Options... to open the Options dialog (see figure MergeColumn and TimestampColumn options). Expand the category Columns and select MergeColumn. In the Value drop down list select the column you want to use as merge column. Closely related to the merge column is the timestamp column which is used for timestamp related operations like creating a graph. If you set in the Options dialog the TimestampColumn option to <default> the merge column is used as timestamp column. If the merge column does not contain any timestamp you have to set the TimestampColumn option to a column which contains timestamps. There are several ways to load log files. In the File menu you can find the command Load... This will open a file browser and you can select the logs you want to load. Previously loaded logs will be closed. In order to merge previously loaded logs with new logs you can use Merge... which will also open a file browser. Instead of using the Merge... command you can also use Drag & Drop. Drag the log files you want to load from a file browser like the Windows Explorer to the window of Ascolog Insight and drop them there. When you open logs with either Load..., Merge... or Drag & Drop the complete log files are loaded into the computer's memory. This mode is called memory-mode. In memory-mode you can use the full functionality of Ascolog Insight. You can also open ZIP files. ZIP files will be extracted and their content will be displayed. The command Browse... only loads parts of the selected files into memory. The rest of the files are kept on the hard drive and are loaded when they are accessed. This mode is called browsing mode and is recommended if a file or a group of files are too big to be loaded into memory. The browsing mode has the disadvantage that the analyze functions cannot be used and that the files are only displayed in separate views and that they are not merged in the Main tab. If you want to close a log file select the file in the Files window. Right click to open the context menu and select Unload.